One of the most potent elements of Taxi is our shared knowledge that not one of the beleaguered but perpetually hopeful denizens of the Sunshine Cab Company will ever really escape. Everyone there has dreams—of success in the boxing ring or the Broadway stage, or just of finding love or some measure of personal fulfillment. But the series resolutely sticks to its guns in portraying a grubby, working-class milieu where the day-to-day grind keeps pushing long-term plans further and further away. Season four’s two-part finale “The Road Not Taken”—which sees the gang reminiscing about the events that caused them to seek out employment at New York’s dingiest black hole of public-transport-for-hire—is an especially concentrated example of the show’s evocative blend of poignancy and sitcom laughs. With single mom Elaine (Marilu Henner) pondering whether to take a job as receptionist at a Seattle art gallery, everyone chimes in with their own tales of the choices that led them under odious dispatcher Louie De Palma’s (Danny DeVito) malicious, sweaty thumb. Tony (Tony Danza) tried to stand up to gamblers wanting him to take a dive in the ring—only for the other boxer to take his dive first. Latka (in an extended scene more impressively touching for taking place in subtitled “foreign guy” gibberish) left his mama back in the unnamed old country, fueled with visions of People magazine and a pre-murder O.J. Simpson. Louie was always a prick. And Alex, on the fast track to a big promotion, just couldn’t force himself to buckle under to his boss’ belittling corporate fealty oath. But it’s the origin story of Sunshine’s perpetual drug culture burnout the Reverend Jim Ignatowski (Christopher Lloyd) that’s the episode’s centerpiece. It’s not that it’s especially helpful to Elaine (who waffles for so long that her prospective boss revokes his offer—after the furious-at-being-pressured Elaine socks him in the gut). But it’s yet another glimpse into the mind of Taxi’s wise-man fool, as we see him in flashback as an upright, straight-edge Harvard undergrad, hard at work on his thesis on Plutarch’s Lives. He disdains the drug experimentation of his girlfriend and her pothead friends (including a Bosom Buddies-era Tom Hanks, who’s pretty awful but does one stellar stoner face-plant). 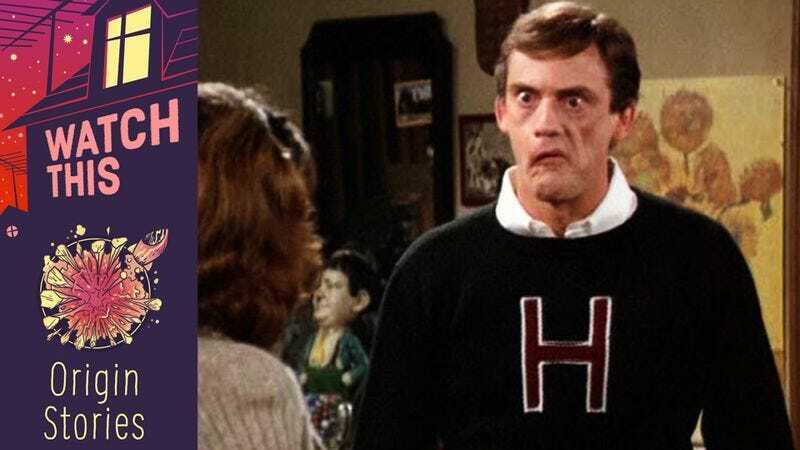 Like Barney Gumble on The Simpsons (also on his way to Harvard before he was doomed by one Homer-proffered beer), Harvard Jim is portrayed as a prissy, clipped-voiced, sober-minded genius—with a predisposition to addictive behavior. “Medical studies have shown that marijuana is habit-forming and leads to harder drugs,” lectures Jim, “And who knows—I could be one of those people.” When pressured into loosening up by taking the merest nibble of a single pot brownie, Jim’s inevitable downfall (signaled by Lloyd’s hilarious approximation of the Reverend’s signature, slack-jawed, glass-eyed countenance immediately upon swallowing) is, in true Taxi fashion, deeply funny and tragic in equal proportion. Like everyone on Taxi, Jim’s lucky he washed up where he did, in a garage full of supportive, good-hearted losers like himself. But his presence there also carries the weight of what he’d have been had he not washed out at all. Availability: “The Road Not Taken” is available for streaming on Hulu and CBS All Access and on DVD.